US-backed Syrian fighters have paused their offensive near the Tabqa dam so engineers can do any work necessary to ensure it continues to function. The Syrian Democratic Forces alliance is battling so-called Islamic State for control of the structure, which is on the River Euphrates west of Raqqa. 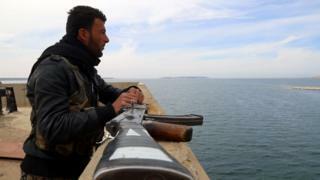 On Sunday, the US-led coalition against IS denied claims by the group that air strikes have damaged the dam. But its former chief engineer warned the control room was “out of service”. The UN has warned that if the dam were to collapse, it could lead to flooding on a “massive scale” across Raqqa province and as far downstream as Deir al-Zour with “catastrophic humanitarian consequences”. Why is the Tabqa dam important? About 60m (200ft) tall and stretching 4.5km (2.8 miles) across the eastern end of Lake Assad, the dam is Syria’s largest. IS captured the dam in 2014, giving it control of a vital reservoir and a hydroelectric power station that supplies large parts of the country. The coalition also says the dam has been used by hundreds of IS foreign fighters as a headquarters, as a prison for high-profile hostages, as a training location and to plot attacks outside Syria. Senior militants are said to have chosen to shelter at the dam because they believed the coalition would never bomb it and risk causing a flood. The assault on the dam is part of a wider SDF offensive aimed at also driving IS militants from the nearby town of Tabqa and its airbase, which fell on Sunday. Is the dam at imminent risk of collapse? On Sunday, IS said coalition air strikes had locked the dam’s gates, causing water levels to rise dangerously behind the structure. It published photographs showing what it said was the “burnt control room” and warned that the dam might collapse “at any moment”. Civilians living downstream in Raqqa – the de facto capital of the “caliphate” proclaimed by IS in June 2014 – were told to evacuate and many began leaving their homes, according to the activist group Raqqa is Being Slaughtered Silently. Later, the jihadist group reportedly sent cars around Raqqa with loudspeakers, telling people the dam was intact and they had no need to evacuate. The coalition meanwhile insisted the dam had not been targeted by air strikes and had not been structurally damaged “to our knowledge”. It published aerial photographs apparently taken on Sunday and said the SDF was in control of a spillway to the north “that provides water to an irrigation reclamation canal which can be used to alleviate pressure on the dam if need be”. Why is the offensive being paused? The coalition stressed that it was “taking every precaution to ensure the integrity”, including by avoiding the use of high-explosive munitions in air strikes. But on Monday afternoon, the SDF announced that it was halting its operations around the dam for several hours to “ensure the safety” of the structure. The decision came following a request from the dam’s administrators, without specifying whether they were part of the Syrian government or IS, it said. Abdul Jawad Sakran, a former chief of engineers at the dam who is based in Turkey but still in touch with people working there, told the BBC that the photos of the damaged control room were authentic. The room was “completely out of service”, which meant there was no way to monitor water and oil levels, hydraulics and power generation, he said. Kurdish, Arab, Turkmen and Armenian militias opposed to IS established the umbrella group in northern Syria in October 2015. Since then, its 50,000 fighters have seized about 6,000 sq km (2,300 sq miles) of territory with the help of coalition air strikes and special forces personnel. Although the coalition estimates that about 60% of the SDF’s fighters are Arabs, the force is led by the Kurdish Popular Protection Units (YPG) militia. This has caused trouble for the US with a major ally, Turkey’s government. It considers the YPG an extension of the Kurdistan Workers’ Party (PKK), which is banned in Turkey and is designated a terrorist group by the US and EU. In response, the US has pledged to support only Arab groups within the SDF.